Does it have every song from Zeppelin? 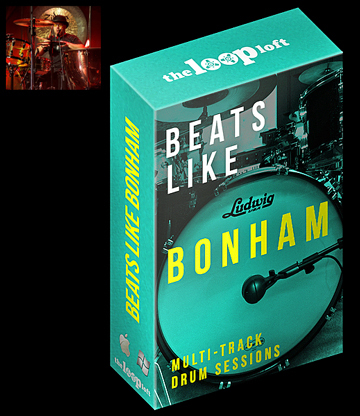 It's beats "inspired" by John Bonham's drumming that you can click and drag into your own songs. I think the drumming is accurate, but lacks a lot of the feel and groove, that made Bonham, Bonham. It says that it was recorded with the Ludwig Maple kit that Bonham had? What a waste of money. Sorry but this just won't do it for me. I pulled the individual tracks into AcidPro7 and then mixed it to spec... it still lacks some feel as good as I can make it, kinda frustrating. What I am going to do is send the signal to an amp, the re-record it as a live take in my mancave which is THX. Maybe I can wake it up a little that way. As one engineer once said "The only way you'll get a drum kit to sound like Bonham, is to resurrect him from the grave"
It was the man himself who collectively formed those amazing characteristics of feel, sound, groove and technique. On the flip-side, thanks for sharing the link Dallas. I think some may find it a useful tool, even if just for experimenting. And that, is exactly what makes John unique in the rock drumming world.